The Edo State Governor, Mr. Godwin Obaseki, has said that execution of projects such as roads, potable water supply and electricity projects identified by the Ward Development Committee in Uhunmwode Local Government Area, Edo State, will soon commence. The Ward Development Committee is an initiative of Governor Obaseki to spread social and economic development to wards across the state, with a pilot phase in Uhunmwode and two other local councils. At a town hall meeting in Ehor, the administrative headquarters of Uhunmwode local council, Obaseki said the projects to be executed will include roads, provision of potable water, rural electrification, agricultural and educational projects as well as the provision of skills acquisition centres, healthcare centres, among others. He said the construction of roads to link communities and the resuscitation of five boreholes will commence in September, urging the people to set up monitoring teams to ensure proper execution of the water projects. On rural electrification, the governor said his administration is working with the Rural Electrification Agency (REA) to provide solar-powered electricity to homes, as his administration has lost confidence in the Benin Electricity Distribution Company (BEDC). “We will also focus on primary healthcare to bring succour to the people. We have started with 20 primary health care centers as pilot programme with two health centres in Uhunmwode local council,” he added. He declared that the local government system has failed in bringing governance closer to the people, adding “The local government as a tier of government has failed. The state government will support the councils in discharging their responsibilities. I will set up a governor’s advisory committee with one person representing each ward to checkmate the activities of local government leaders. He added that his next visit to the council will be to evaluate work done as well as the projects executed. Mrs. Felicia Iyore Onibone, said members of the Ward Development Committee toured communities in the council to identify priority projects that will benefit the people. Special Adviser to the Governor on Basic Education and Chairman-Designate, Edo State Universal Basic Education Board (SUBEB), Dr. Joan Osa-Oviawe, said caterers for the school feeding programme are being selected in preparation for its commencement. She said about nine schools in Uhunmwode are benefitting from the Edo Basic Education Sector Transformation (Edo-BEST) programme, noting that all the 86 schools in the area will be captured soon. The Commissioner for Health, Dr. David Osifo, said two primary health care centers in the local government areas are part of the 20 primary healthcare centres captured in the pilot phase. 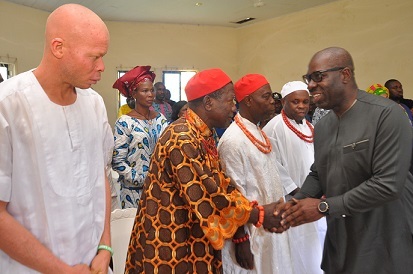 The Enogie of Ehor, His Royal Highness David Igiehon expressed appreciation to the governor for his interest in spreading development in the area. He said members of the community will remain loyal, committed and support the vision of the governor for the area.